Yasou ! Hello ! And welcome to Studio 9 Studios ! Yasou ! Hello and welcome to beautiful Karpathos Island, Greece. 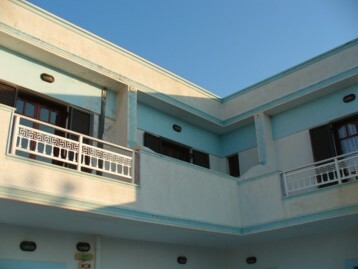 On this home page we'll introduce our clean and affordable accomodations for your relaxing and enjoyable visit to our paradise in the Aegean Sea! Also, listen to the music of our friend from the USA in the free tune player! Enjoy our blue skies and relaxing atmosphere. 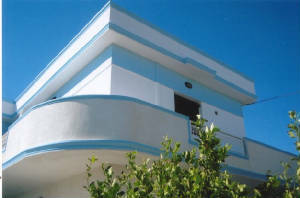 Irene Psaras is your host for clean, comfortable and reasonably priced vacation studios and rooms here in the beautiful island of Karpathos, Greece. Running a lodging establishment takes a great deal of time and dedication. It can often be a twenty-four-hour a day job and customer satisfaction is extremely important to us. We hope that you will find a room perfect for your choice. Due to our reasonable rates, you surely will have more Euros to spend on the fun and relaxing aspects of your visit. There is a wonderful beach, Amoppi, within walking distance where you can take a cooling swim in the Aegean Sea. Many fine restaurants are in the immediate vicinity specializing in authentic Greek cuisine. In addition, you will find minimarkets for those quick snacks and other needs. 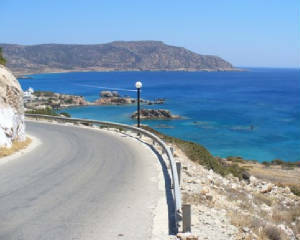 Nearby is the capital city of Pigadia, also known as Karpathos, which you can reach by local taxi, motor bike, or rental car and where you can dine in the cool breeze next to our beautiful natural harbor, contact your friends and family at a local internet cafe, or walk the quaint narrow streets filled with interesting shops suited to every taste! And you can make our fine Studio 9 rentals your headquarters and home away from home! On our beautiful island, there are many opportunites for fishing and diving adventures. And the Tomas Fishing and Diving Shop in Karpathos/Pigadia is the place for you to go to take care of your fishing and diving needs. For a photograph of the shop, just go to our Directions/Map page and at the bottom you will see the shop! Night in the capital of Karpathos. Dining at the natural harbor in Pigadia. A nice view of some of our balconies. For information on rates and availability, please email us at greeknut@aol.com . Wonderful views await you near our studio rentals.